The vows that you make are the heart of your wedding ceremony. Simple words full of extraordinary meaning and importance, for they are your words, and reflect the intention and vision that will define and shape your future lives together. 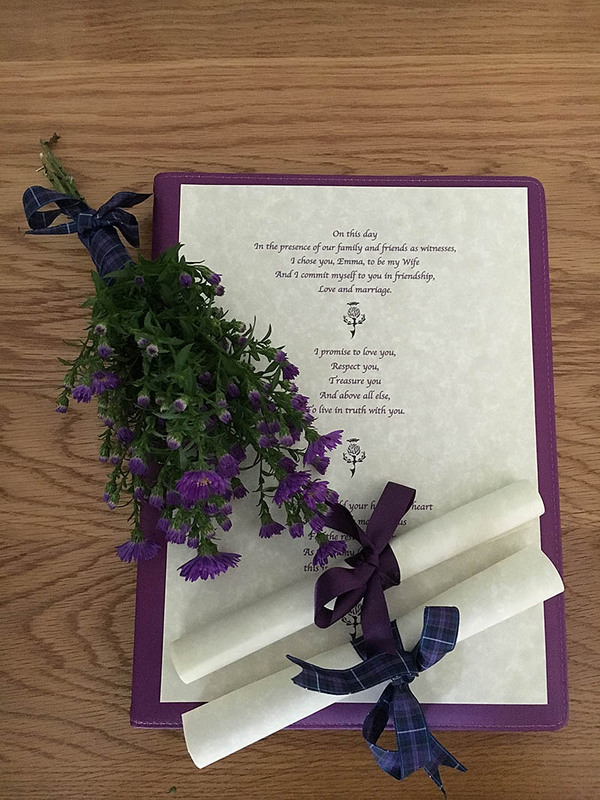 Vows rolled in parchment paper, and tied in wedding colour ribbons for a Flower of Scotland themed wedding. 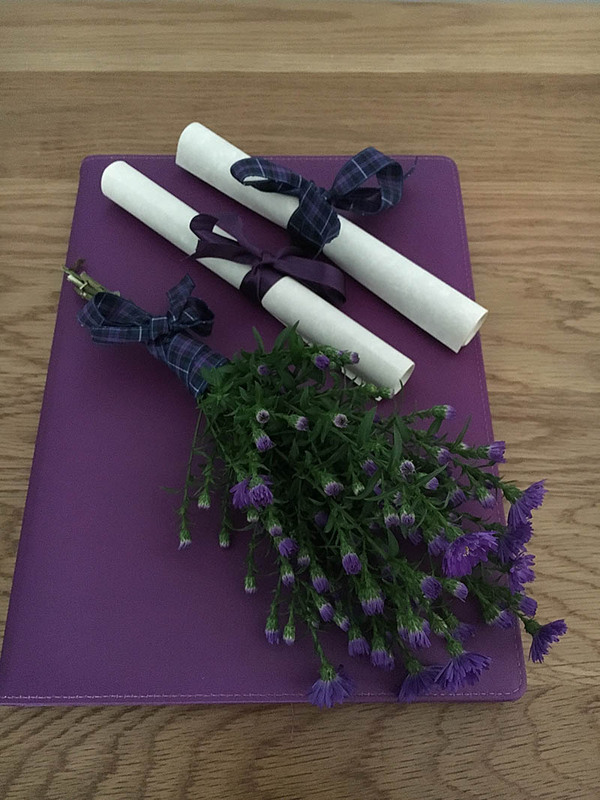 As a wedding celebrant, I work closely with my couples to help them to create wedding vows which are personal and significant to them. Writing your own wedding vows is an incredible and meaningful way to personalise your wedding ceremony. It’s a chance to tell your story, to give your guests a peek into what makes your relationship unique, and to share deep and meaningful words with the one person you love most in the world. It’s a daunting prospect and a pretty challenging task because it’s so intimate. For you are baring your heart to your partner, and are doing so in front of family and friends. Finding the right words and fitting them into a structure that flows effortlessly isn’t easy. Read my six top tips to help you to write the perfect wedding vows. All licenced wedding venues require you to say some set sentences, and church weddings are very strict in this regard too. Using a wedding celebrant gives you the freedom to be as creative and loving with your vows as you wish. You can move away from the set scripts to include elements from a song or a film that was special and meaningful to you both, an anecdote or shared, treasured memory. You may want to keep your wedding vows a secret from each other until your wedding day, but talk together about the content, the length and the style. Balance and harmony is key to getting it right and creating a beautiful wedding ceremony. How long should our wedding vows be? Will we share jokes or rather keep things more generic? Shall we incorporate elements of traditional vows into your own? Find a quiet place when you have time to really think about your relationship – what it means to you – what do you love most about your partner, what do you value most in your relationship – what are you looking forward to most, and what promises do you want to make as you take into your care and keeping the happiness of the one person whom you love best. Don’t put writing your wedding vows off until the last minute. Try to have them written at least a month before the day. This gives you plenty of time to revisit them and maybe tweak them a little and reflect on their meaning. Don’t be afraid to use a traditional wedding vow structure as a template. Many of my couples have found this the best way to begin. I will be faithful to you, I will stand by your side and sleep in your arms, I will listen to you with compassion and understanding and speak to you with encouragement. This is my intention, completely and forever. Remember to say I love you. Choosing a wedding celebrant for your wedding ceremony gives you the freedom to write your wedding vows exactly as you wish. Yes, writing your vows does take a lot of time and thought, but when they are ready and the words truly capture how you feel and what you want to say, the feeling is truly amazing!! Reading your vows to the one you love in front of all your friends and family is the part of a wedding ceremony that many couples find the most daunting. In my next post, I’m going to show you some different ways vows can be said to make it less so.